The number of asylum-seekers seeking shelter on the streets of Paris has noticeably jumped since the start of the week and the closure of the notorious Calais ‘Jungle’ camp. Some of the boulevards are filled with tents and makeshift shelters. The majority of migrants are now living in the 18th and 19 districts in the north of Paris near the Stalingrad metro station. “We have seen a big increase since the start of the week. 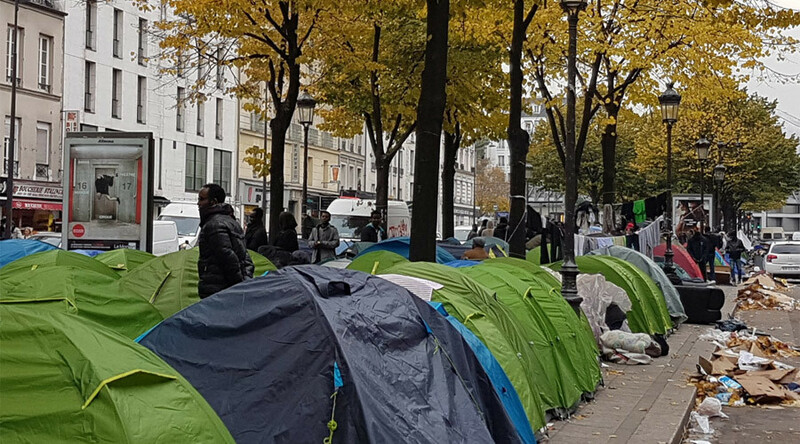 Last night, our teams counted 40 to 50 new tents there in two days,” Colombe Brossel, Paris deputy mayor in charge of security issues, told Reuters. On Friday, volunteers distributed meals for the asylum-seekers in the camp. One of them told RT France that there are not “enough meals” for refugees. The number of asylum seekers in the camp jumped from “2,000 people to 3,000 people and more, in two days, with the closure of Calais,” Heloise Mary, from the bureau of migration, told BFMTV. Minister of Housing Emmanuelle Cosse, however, dismissed rumors that Calais migrants were moving into Paris, in a statement to AFP. “There is no influx of [refugees from] Calais to Paris,” she said. The area near Stalingrad metro is ‘familiar’ to asylum-seekers. It has been a place for their temporary stay since winter 2016. Authorities relocated the majority of refugees living near the station back in September and bulldozed the makeshift camp. Between 400 and 2,000 asylum seekers were registered in the camp at different periods of the year. Earlier in October, a video emerged from the scene of the camp showing rubbish, broken tents, and trashed mattresses. The camp underwent several mass evacuations, but asylum-seekers repeatedly returned to ‘their’ place near Stalingrad, which witnessed fierce battles between asylum-seekers. Hundreds of migrants were seen attacking each other with metal poles, planks of wood, and other debris in an alarming video recorded by residents from a nearby building in April. At least four people were seriously injured. Social media has recently been questioning if Stalingrad camp may become the next ‘Jungle’ after the removal of the notorious Calais ‘Jungle’ in northern France. Authorities, however, have promised that they will open a new reception center by the end of October so that asylum seekers do not have to look for shelter on the city’s streets. In 2015, France took down 28 makeshift camps and rehoused about 19,000 refugees. Meanwhile, the operation to clear the ‘Jungle’ camp near Calais kicked off this Monday. The demolition of tents and wooden structures, which the residents had used as shelter, started at the site on Tuesday. Violent clashes between police and inhabitants were reported, with tear gas deployed by officers. The camp was reportedly set ablaze last night by refugees displeased with the demolition, though it may have been done by angry local residents critical of the camp. Thousands of migrants looking to cross the English Channel to find asylum in the UK have been holed up at the camp for months. Britain, however, only agreed to take in around 1,000 migrant children with relatives already in the UK from the camp.